Looks like knitting is back on the menu. Yes, I have found a little more knitting time. Enough to finish that pair of socks for my friend, Miche. Shes says they fit and I'm delighted. I hope they bring her some cozy happiness. My name is Ellen and I love German sock yarn. I also started that giant knitting project my mother gifted me LAST year in Germany. I tried to follow the basic instructions/pattern variations/cast on my mother included from the woman who was selling the kit, but I added some stitches for the cast on and settled on doing a stockinette throw. I didn't slip the first stitch, because I read that somewhere in her general instructions, I thought it was a big yarn, big needle directive, but I wished I had. I don't wish it enough to undo what I have. LOL. The yarn is actually 4 strands that make up an almost ribbon like look. Gives me some idea for some random yarn I have not actually purged myself of yet but I shouldn't get ahead of myself yet, and just focus on finishing this project first, right? 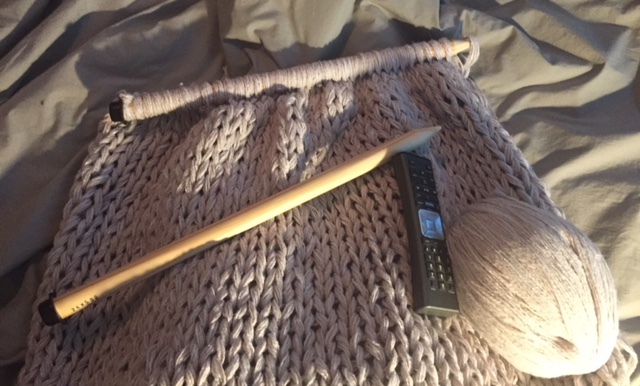 I thought it would go faster than it has, but even though I'm knitting more, I'm not knitting every day. I just can't. That's how it is. I've already got another pair of socks on my needles for when I'm out and about. However my next thinking project (means home knitting only) will be another baby sweater. People and their babies. Sheesh.